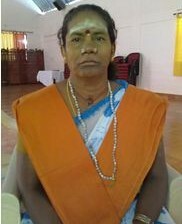 Home > Nirahara Samyama > Should I Give-up Food? What’s the Fun? So should we all give up food? What’s the fun in it? Many people get afraid even with the thought of living without food. They instantly declare their vows made to their favorite cakes, sweets, and curries. It almost sounds outrageous to them to even imagine parting with their life i.e. food. We want you to know that a Nirahari need not decide to leave food. 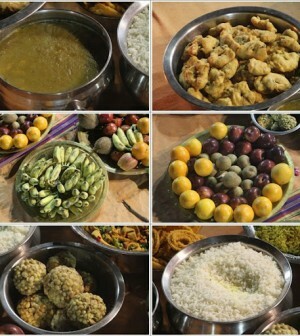 With Nirahara, you will become a better eater, you will develop an authentic relationship with food. 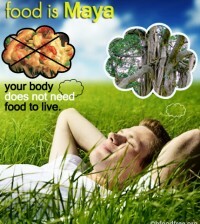 In the Vedic Tradition, food is sacred, food is God. It is created and shared in abundance to fulfill where there is real hunger, and one who respects food is not to waste food, by not dropping food where there is no hunger outside i.e. dustbins, already filled stomachs or where there is no hunger inside i.e your stomach. That is being authentic with food. If the answer is yes to anyone of these questions, then Nirahara is for you, your conscious choice. We are not saying that everyone should do the Nirhara process and give-up food for life. Infact, Nirhara is about discovering the hidden treasures within you, which the Master calls as ‘re-awakening the original intelligence in you’. So, there is no giving-up, only rising-up to greater health, empowered living, excited energy. The truth is, being a Nirahari you only give-up your sufferings, your patterns, your diseases. You give-up the mind that constantly weakens you with self-fulfilling negative prophecies that doubt the natural good health already happening in your body, your life. You begin to see the limitless possibilities, which so far are hidden deep within you. So, you learn to never give-up on yourself, and your body. The Master defines Good health – “Good health is not just an absence of disease, it is a state of positive well-being. We are not just humans who are destined to fall sick and get cured. We are an abode of Bliss. We only suggest, if you are curious, experiment this beautiful, spiritual process with integrity and authenticity, so you can be free from all things that bind you —food related patterns, eating disorders, emotional disturbances, lifestyle induced diseases, psychosomatic diseases, the list goes on. The most important instruction that the Master gives us when we start training for Nirahara is “never use our will power” to refrain from eating during the process. 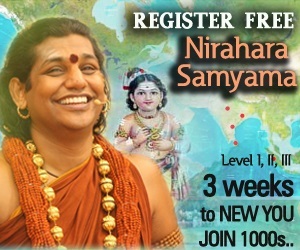 Paramahamsa Nithyananda says “when we use our will power during the Nirahara samyama, it becomes one more pattern where you are forcing the body into submission”. He goes on to add, “you will know the self sustaining intelligence in your biomemory is being properly awakened when you don’t have to put in any effort from your side and yet you remain healthy in a state of intense happiness and experience excitement for no reason. You should be able to actively go about your daily routine”. When Real Hunger Comes, Eat – During our training, if anyone ever felt hungry, they were asked to break the process immediately and eat at once. No Excess Weight loss – None of us have lost weight beyond the unhealthy baggage we bore. In fact, our muscles are getting toned without doing any weights. 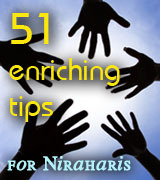 Anti-Aging – Niraharis experience the state of feeling and experiencing younger body and mind. They feel radiant, and start carrying a grace in their bodies, which is beyond beauty. This is a unique and personal experience for each. 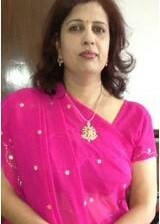 Yogic Bodies in the Making – The Master defines a Yogic Body as – ” A body which has 5 components. 1. Power. 2. Stamina 3. Flexibility 4. Physique. 5. Energy. When you own your body and design it as you want with yoga into a healthy and blissful body it is a Yogic Body. When your movements are such that your body becomes healthy, graceful as you want, it is a Yogic Body. ” “Yoga is not even a goal, it is a continuous happening. The word Yoga, literally means ‘UNITING’.” The Nirahara Yogis experience being food free, as a constant happening. There is no scale to – we have reached. We are developing yogic bodies with strong nervous systems. 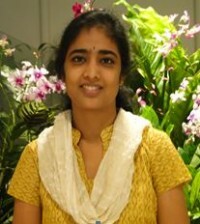 The Nirahara process also uncovers various extraordinary capabilities in us such as powerful intuition, deeper understanding and experience of subtle, spiritual truths, telepathy, the ability to manifest physical objects, etc but none of it brings about a sense of pride which is usually considered a block in spiritual progress. The best take away is the de-hypnotization from societal and suicidal conditionings that we put with up all our lives. Comparison, jealousy, fear and greed and other lower level emotions melt away. Humans are simple beings meant to live blissfully. We are an abode of bliss. All we need is to take responsibility for ourselves to make our – impossibles to I M POSSIBLE. Since when did someone have a right to complicate our lives and now even our bodies? We are not interested in telling you – yes we will one day, eradicate hunger. We cognize that when we solve our problems, our patterns within, we start enriching ourselves, and the world with that collective group consciousness. And naturally, the more people who live a food-pattern free life, the more hunger-free world it will be. We are more interested in enriching those – who wake up in the middle of night, giving-up on themselves to eat leftovers of the chinese takeout they dumped in the fridge a week ago. We are committed to enriching those – who are suffering with life-time investment in medicines, nutrition diets & capsules, anti-aging procedures and pseudo healing therapies. What makes us poison ourselves thus and later complain life is not fair. 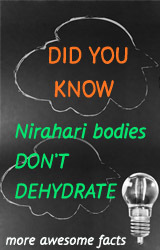 Nirahara is all about reclaiming ownership of your body and mind. 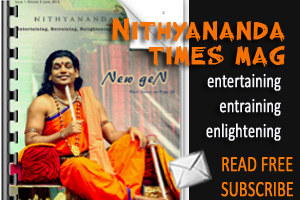 Paramahamsa Nithyananda says, “As soon as you begin comparing yourself with others, you create a gap between you and your body, this is the root cause of disease”. We can tell you from experience that Nirahara bridges that gap, which is why you experience a disease free body and conflict free life with good health. It is nothing but living enlightenment. Your very idea of “fun, happiness, joy, sorrow, past, guilt ,relationships, wealth, work ethics etc” will evolve higher, which is why you will suddenly experience a new lease of life with zero baggage from the past. In short, for every human being it is worth the everything to live the Nirahara life. Nothing to lose or gain, but only deep enriching experiences to live, and share with your world.